So... in the past week, I’ve been asked for advice on Bitcoin by my brother-in-law, my local realtor, and close friends from as far away as Texas. These are critical questions to answer. When a new technology is first introduced, all manner of fanciful thinking can cloud people’s better judgment with dreams of easy riches. Think back to 1999: as long as “dot com” was added to the end of a business' name, it could raise abundant funds to pursue all manner of impractical ideas. How well did that work out? Just remember Pets.com, Webvan.com and eToys.co; all certified capital destroying ideas. That was a very bold call to make. But, just six months later, Bitcoin is now currently trading at Charles' projected $17,000 target. Excellent explanation, Chris. You have a gift of explaining a complex topic well, even to a beginner. I find you very good at making an "on ramp" so that a person moving at 0 mph can get moving with foundational knowledge so as to be ready to merge into full speed traffic in the future. Great article overall. There were a couple of places that need some clarification. On the economics of power needed by the bitcoin network to process transactions. The difficulty and work to operate a mining node has NOTHING to do with how many transactions it processes. If you were designing a network that couldn't be shut down - how would you do it? If a combatant wanted to shut down the network, he would simply destroy the machine that is processing it. If they knew which machine. How would you design it so that the 'enemy' could not predict which machine would process the block of transactions? You have to hold a 'lottery'. So, how do you hold a lottery for computers? You come up with a very hard to complete a puzzle of sorts so that computers have to brute force several attempts to solve it. Like a Sudoku puzzle, it is very difficult to solve, and you can't use a pattern or key to solve it - it's trial and error. So the power consumption lies ONLY in the attempts to win the lottery for the right to process the transactions. The actual number of transactions doesn't affect the lottery where the energy is being spent at all. So does the difficulty and energy always go up? No. The program was written to evaluate the hashing power of the entire network and throttle itself as needed. The target time is 10 minutes to solve these complex puzzle lottery attempts. The program records the time it takes to solve each block. Sometimes the puzzle gets solved very early, say 1 minute. Sometimes the luck of the problem works the other way and it might take 30 minutes. The average just needs to be 10 minutes. About every 2 weeks, the program takes stock of the average time it has been taking and then adjusts itself. It simply makes the puzzle harder (to increase the time - if the network has been growing too fast). Or it makes the puzzle easier (If it is taking longer than 10 minutes- some miners might have left because electricity was too expensive). When it was first started nine years ago - it ran fine on just a handful of computers - and would still only technically require one computer to run. 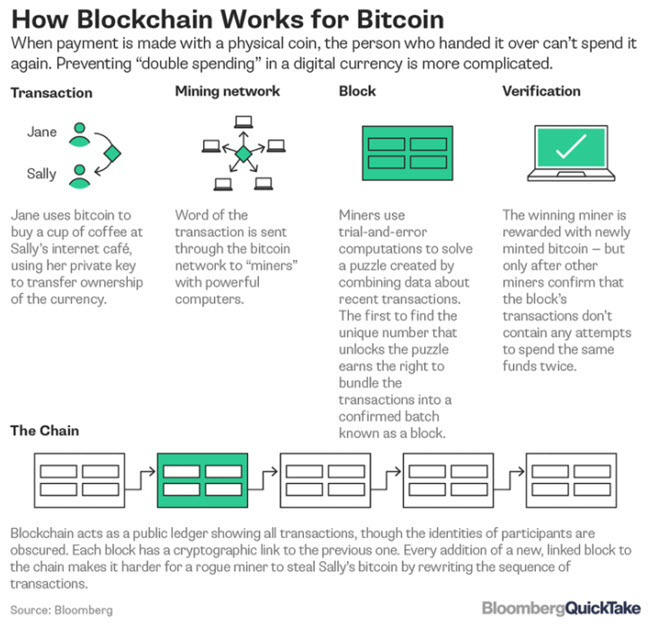 New technology is being folded into the program called 'lighting network' that uses a different channel that allows thousands, or hundreds of thousands of transactions per second on a second layer rooted into the main layer for clearing. This is done with little additional power requirements. When comparing costs with Visa, as bitcoin doesn't require buildings, HR, Security firms, buildings, maintainers, crooked banksters, corruption fines etc - bitcoin handles all of that internally. 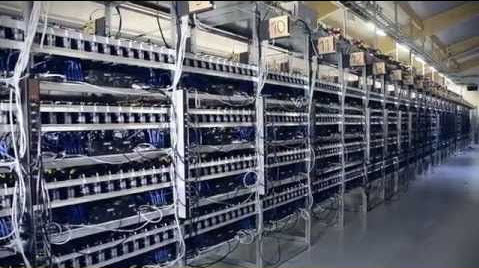 How much electricty is required to keep all the lights on, the data warehouses, the fraud departments, chargebacks, collections departments etc., Bitcoin makes all of the other aspects of visa\banks obsolete in many ways. When comparing the costs of the complete picture - bitcoin wins. Bitcoin (cryptocurrencies) seems to me to be the natural evolution of money. Government printed fiat lasts on average 27 years each. bitcoin is the oldest crypto at barely 9 years old. It's still a child. It's going through growing pains and likely will for years. It's still pretty early to guess what it will look like when it grows up. Many reasons to watch it. MM gives a good explanation of block chain technology, and a frame for appreciating Bitcoin from an historical point of view. He explains what the underlying problem is that block chain (or, more generally, full consensus distributed ledger technology) attempts to solve: reaching 100% reliable consensus. And he talks about his concerns re Bitcoin as a deflationary currency - it’s currently functioning as something speculative. MM sees all of this as a turning point in history. In Part 2 of the video (38:30), MM introduces a new alternative to block chain technology, Hashgraph, developed by Leemon Baird. Hashgraph is based on two long-time standards, Gossip Protocol and Voting Protocol (with a twist). Hashgraph is light years faster (calculated for visual interest to be the difference between a snail's pace and a jet going Mach 2), and because, unlike block chain, it does not rely on solving increasingly difficult math problems, it takes very little energy to run. A node of interactions can be run on your cell phone. Also, unlike block chain, consensus is 100%, not just increasingly close over time, so it is fairer. So, according to MM’s sources, Hashgraph is faster, better, and cheaper. And hashgraph may not be the final solution in this quickly evolving field. And MM (who has been totally in precious metals) is going to invest in this area, too. The real message is that we are at the beginning of something really big, and it is still in the experimental state, so we need to learn. Thank you Tourcarve for the link. This is the best video I have seen in a long time and makes a very good case for Hashgraph while pointing out fatal flaws with Bitcoin. Thank you Chris Martenson and team for ALWAYS having such timely and informative articles. Data-driven, and educationally outstanding. And with perspective. You seem to always know what I don't understand, and need to. So none of these people were shoe shine boys? I guess we haven't reached the top yet. Get In On the Next Big Thing In Cryptocurrencies! Straight Line Logic Announces the Bobcoin! Order Today! It’s never too late to join the most stupendous trend of a generation, still in its infancy. Straight Line Logic announces the issuance of the Bobcoin, a Cryptocurrency that will use Blockchain Technology! Yes, that’s right, a Cryptocurrency that will use Blockchain Technology! Here’s a chance for you to exchange all your legacy moneys, currencies, and debt instruments—precious metals, credit cards, debit cards, money orders, checks, traveler’s checks, cashiers’ checks, second mortgages, euros, pounds, yen, yuan, rubles or good old fashioned Federal Reserve notes—for the exciting, innovative, liberating Cryptocurrency of the future, the Bobcoin. Count on it, the Bobcoin will be the next Cryptocurrency they’re talking about at cocktail parties and bongathons. Space on the Straight Line Logic server is limited. We’ll only be able to issue 1,000,000,000,000,000,000,000,000,000 Bobcoins before we run out. The pace of issuance is controlled by an algorithm written by a group of bright eighth graders in Mrs. Mendies’ math class at Baltimore’s Ivar Kreuger Middle School. Act now! The initial price of $1000 per Bobcoin can only be held open for a short time. Our astrologers project that once these treasures are free to trade in the Cryptocurrency market, they’ll rocket to $100,000, a 9,900 % return. Not bad for the first half-hour! And don’t forget, Bobcoins are a Cryptocurrency that uses Blockchain Technology! Yes, I want to get fabulously wealthy by owning a computer entry! Act today and we’ll discount your first Bobcoin to $999! So, my first question is, "What is 'a greater fool?'" My second question is, "What is an MTV?" Chris is right, the value of bitcoin come from the miners. The value of bitcoin come from be the first and from the miners. The following article also come to the same conclusion, but in other words: When the technology of BFT (bizantine fault tolerant) consensus be fully developed, the miners and high electric power will be irrelevant, then, “the platforms will be irrelevant and easily cloned”. We agree with Mike, this is a change from vertical systems of power to flat systems, its a revolution. But today there is no working distributed ledger, (not blockchain based) like iota, hashgraph, etc. , that work with anonymous nodes, they work with trusted nodes, they could work in the future could be. Very important also hashgraph is not open source. But bitcoin, ether and many others crypto can change part of their consensus protocol, (the PoW part) to another that have the same promises of the hashgraph, like fast transactions and store of digital assets. Also any crypto can use a new complementary protocol to make millions of transactions with full privacy, just search in internet "Lighting Network". But, in the long run. . . Unfortunately, I keep getting lost in the minutia of this subject. Speed, platforms, nodes, etc., leave me on the outside in this discussion and force me to focus on firewood and canned goods as a way to strive for resilience and wealth protection. And, I agree that Chris does an excellent job in bringing these issues forward for examination and debate. when technological progress increases the efficiency with which a resource is used (reducing the amount necessary for any one use), but the rate of consumption of that resource rises because of increasing demand. Just wanted to thank you for both your excellent content and your generous nature. The fact that youve made this and other articles free for those of us currently “belt tightening”, is greatly appreciated. Let’s face it, a potentially richer but difficult future is your message. And you’re true to it..... Thanks! I have a few wonderings. will the increase in crypto price result in more energy use? And the decrease in price the opposite? What impact and in what quantity, for society, will result from these miners consuming the cheapest of energy? Is the system self aware of its limitations? And if not what and how will this difficult realization find a physical reality inducing impact? The information in it is a VITAL addition to Mike Maloney's video (Hidden Secrets of Money episode 8) to understand his presentation's strengths and holes. It is also a useful source of terms and concepts for a beginner. One person Mike interviewed, Chris Ellis, said that one of his concerns is that most of the people in the Bitcoin space "are in communications and marketing - the business of persuading people" (and that what we need are more people who know how to encode a cryptocurrency). Parallel to what Chris wrote in The Crash Course, we need to trust ourselves - to be able to appropriately trust ourselves - if we are to engage with this new technology - a daunting task in the beginning. When you write that this is a change from vertical systems of power to flat systems, what does that mean? Guess: Is the blockchain vertical? And is that because the blocks stack? Again, thanks for your comments and leads. Haven't been here in quite a while, but decided to drop in after reading this piece on ZH. Great writing as always. Chris truly has a gift for explanation. But there's just a lot that's plain wrong in this article. Chris, you allege that when the reward goes down, the miners will walk off the job and blocks will take too long to verify. Did you even read the bitcoin white paper? It doesn't work that way. It runs on a moving average algorithm. If the blocks take too long because of less miners, the complexity of the proof-of-work exercise is reduced by changing the number of requisite leading zeroes in the hash code. But much more to the point, many statements in this article seem to reveal that you errantly think that the process of transaction validation is inherently difficult or compute-intensive. That simply isn't true. The proof-of-work algorithm demands insane amounts of computational capacity ARBITRARILY, for the purpose of creating work that never needed to occur in the first place. To understand Blockchain requires putting it in context. They needed to solve a problem (how to avoid one guy or a small group of bad guys) from taking over the network. The solution that worked fine for a proof-of-concept prototype was to create completely unnecessary "busy work", and that busy work is what consumes all the electricity and computing capacity. Blockshain is a mania. It's not suitable or scalable to the applications it is being engaged in, but plenty of people are working on more intelligent solutions. I wrote up a detailed explanation debunking Blockchain here: www.macrovoices.com/blockchain-debunked. Chris, my respect for your work is immense, and always will be. But honestly, I think this is a rare example of a case where you need to do more homework. This website has spent lots of time on the 3 forms of wealth: primary, secondary, and tertiary. After I read this post, I wondered if we need a fourth. Erik - Thank you for posting your paper here. Interesting and useful framing of the significance of Bitcoin/Blockchain and the state of the art, and the idea of being stuck. Also, appreciated a number of other topics, such as the technical matter of how a solution gets vetted, your view of what a government-issued cryptocurrency world would look like, and how we cannot know where this is all going. The idea of being stuck with re a particular design is important to contemplate - how and where it happens - because we can’t make good judgements from inside the wrong frame. Erik, that was a great and eye-opening read, thanks for providing your paper. It would be wonderful if CM could moderate a debate between Erik and Max Keiser (or another advocate if not expert) on the merits of Bitcoin. Quick one before we have to leave for the afternoon. I understand the relative focus on bitcoin, however hope that the webinar this afternoon will more focus on the general evolution of the blockchain and what role it could play in society. Despite the Ford T (Bitcoin) puttering along, it seems that that are potentially already GM (ETH) and possibly Toyotas (ADA?) on the planning board. I believe that blockchain is much larger then cryptocurrencies, so it needs to be looked at from a larger perspective. The Vertical Government, is the political system that we know. The bitcoin, cryptocurrency ideology is to bypass central systems, central banks, by giving the power of money creation and administration to the people. this can be checked when you read the text of genesis block that satoshi nakamoto put there "The Times 03/Jan/2009 Chancellor on brink of second bailout for banks". If government can not control the money, they are powerless. 1- The current vertical systems (the Government) dont want to give the power. 2- The citizen are not educated, prepare to work in this new type of human relationships. DLT and Cryptocurrencies are a tool that help to solve problem 1. Summary: we are in a point in history where we are moving from vertical to flat systems. PoW like Erik and Chris Write, is part of the consensus mechanism. The problem is how to work with anonymous people whitout need thrust. Because Satoshi Nakamoto dont know that BFT algorithms exist. He decided to implement his own algorithm. The Satoshi solution was include a PoW (proof of work) to slow the the amount of people (miners) that can give good solutions to a determinate mathematical problem, if few miners can give good solutions, then few miners can cheating. This solution was very good when few transactions where processed, but now is a bad solution because slow the bitcoin network. bitcoin maximum transaction per second are 7, systems like paypal make hundreds and visa make thousands. The second evolution in cryptocurrencies is the store in the blockchain of rules instead of fixed values, this rules was given the name of "smart contracts". with this "smart contracts" any crypto can implement a settlement channel, think of this like visa and mastercard, off chain payments, this is the return of privacy, low fees and super fast payment processing. the original idea was named "lighting network". The third evolution in cryptocurrencies is the implementation of BFT algorithms, this will speed up the blockchain, and in the process will eliminate the need of miners and the high electric power use. But all it not so rosy, many proposed BFT algorithms are sacrificing anonymity and creating new central powers, the coin hoarders. (this is contrary to the original ideology of crypto). UnityCoin is my design of a crypto, with the best features, that really put the money creation and control in the hands of organized citizens, (not miners, not hoarders, no central government, no central team), with full transparency, in a flat open government, where if I (the founder) fail to my duties the community can replace me any time and put another more capable citizen in place. Note 1: We also agree that Ripple is a scam of the big banks and corporations, which does not mean you can not make money speculating with ripple. Note 2: We believe that Chris really understand bitcoin, but the subject is so complex, extensive and new, that need some additional explanation like the write of Erik. Note 3: We agree with Erik, https://www.macrovoices.com/macrovoices-content/list-research-roundup/1474-blockchain-debunked/file Bitcoin is a very successful experiment, just that. is not a fully developed alternative economic system. Also Agree DLT is a very great Thing. Note 4: Erik, need to fix the writing in his article about the "lighting network", because give the impression that the lighting network will replace some part of the bitcoin protocol. This is a addition to bitcoin (or any crypto) that just need a very small changes in the code to support it, to support off chain settlement. Note 5: Erik, correctly see the Orwel, as the cryptocurrency that all the governments of the world want and will create. I would add that, in addition, a new type of government will be developed, something totally new, that will accompany a new well developed crypto currency, (UnityCoin). I already have a first design of this government (e-nation), and I hope to present it to this great group. I think it is more complex than "value comes from the miners." They're necessary, but not sufficient. As a long time client/server networking guy, it may sound really obvious, but you need both clients and servers for the bitcoin ecosystem to provide value. Even though the BCH miners were operational, a certain friend-of-a-friend was unable to access his BCH because his client didn't support the new network. So - both clients and server support are required for there to be "value". Likewise, "the brand" is also key. The chicken and egg problem - you can build the network, and supply the miners, but unless people care, there's also no value there at all. The third element of bitcoin's value is the buy-in from the consumer end. "People believe its valuable" and presto - it is. So that's three pieces that must all be operational for the value to be provided. Miss any one, and the value vanishes. 3) people that want to use the network - and have faith in the brand. There's no point having miners and clients if there isn't anyone on the other side of your transaction. So bitcoin's value: "the operational ecosystem" plus people who find it valuable. That last self-referential part is really key, and why I say the original creators of bitcoin were marketing geniuses. I really can't put enough emphasis on the marketing aspect of the whole thing in terms of creating value. The "Mark" fellow we are listening to today was an early bitcoin marketeer - but I consider him (and those like him) an emergent property of the original genius. Well, that's my belief anyway. 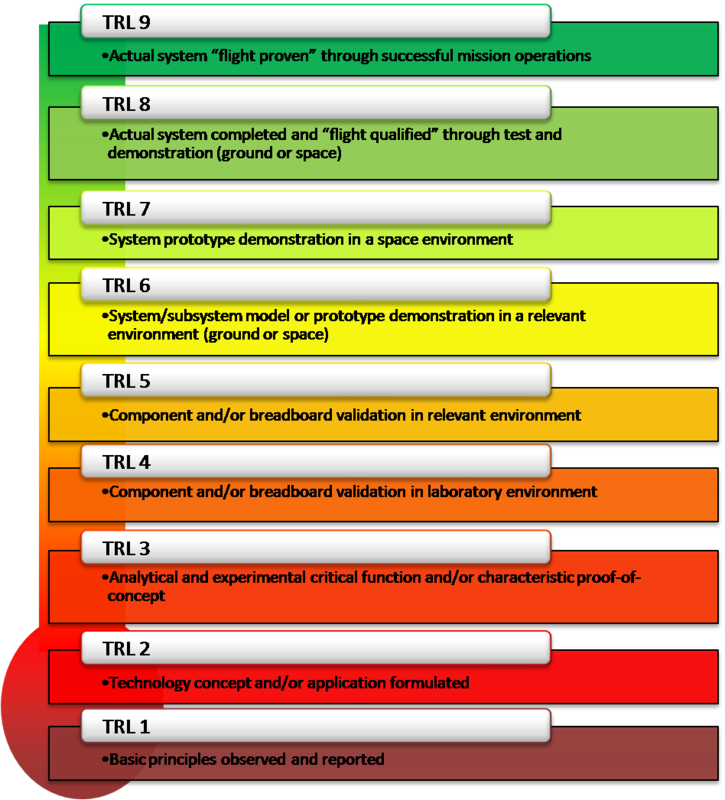 Here's a summary of NASA's TRLs. Almost everything in nature, including government, is a mix of vertical and horizontal. Vertical government (the petty tyrant) still does not work well without lots of horizontal government (the family). When you say government is going from vertical to horizontal, I take it that you are seeing a collapse from tall shotr-tail bell curve to shorter, longer tail bell curve. And though you are right that governments cannot well survive the loss of the control of money, then too governments do not take this lying down. Jesus triggered his death by overturning Ananias' money changing tables, theatening his control of the temple money flow. Others who challenged the legality of the IRS actions (for example, the author of the probably correct and formerly verifiable, but now unsubstantiatable and also irrelevant "The Law that Never Was") have been put in prison, denied the opportunity for fair and legal trial with the admission of evidence, and held either until death (Peter Tenebaum's dad) or until the case was no longer provable (TLTNW). So I expect a full war, with the full force and power of the governments involved, until the governments figure out how to control it. But on a lighter side, the bell curve of collapse has implications for BC: there is definitely a place for a BC that has high certainty against cheaters, and few large transactions. But there is also a place for lower-certainty coins with a higher frequency of fraud, as long as there is a way to quantify the amount of fraud ongoing, and devalue the entire currency together, and thus limit the cost of fraud. The coin that can handle the whole spectrum will be the one that the governments will support, so long as they can write their own expenditures in at some level. Provided that the "certain" storage really is certain and cannot be devalued by fraud, the system will also have the support of the gentry. Provided that the losses are limited, and a person can move themselves to fewer losses as they work their way up the ladder, it may also have popular support. So the coin that takes care of all that is the one to invest in; It will also be the coin most likely to succeed in the end. BC as it currently is, is simply a flat currency; it doesn't sppport the needs of the most powerful game players well enough. First of all, excellent analogy of using the Flyer of the Wright brothers to describe Bitcoin's Distributed Ledger Protocol. That helps me explain Bitcoin to others a lot better. (I also believe Dave F has been saying a similar thing for a while, i.e. Bitcoin is the first solution but it won't be the best implementation of the idea). What if I were to tell you that the central design principle of Bitcoin’s Blockchain is a giant network-wide competition to waste electricity and computing capacity, and that each time someone proves that he has just wasted more electricity and more computational capacity in less time than anyone else in the contest, he wins a prize paid in freshly-minted bitcoin? I know that sounds utterly ridiculous, and frankly it is. No sane person should ever think this is a good way to run a distributed ledger protocol that is meant to scale up to support a global payment network with tens of thousands of participants. But that’s exactly the essence of Blockchain. Seriously. So they intentionally made the mining process much more compute-intensive than it actually needs to be, for the express and intentional purpose of slowing the network down dramatically. The whole idea is to make sure that mining wastes so much electricity and consumes so much computing capacity that nobody could possibly ever buy enough computers to waste more electricity and computing power than the rest of the network combined is already wasting. Seriously – that’s the design goal. Read section 4 of the Bitcoin White Paper if you don’t believe me. But here’s the problem: Only the winner of the math contest wins the prize. All the runners-up consume about the same amount of electricity in their failing efforts, only to lose the race by a tiny fraction. Once again, in a small proof-of-concept network, it’s not a big deal. But if tens of thousands of miners are competing to create the same block, and only one guy wins and gets paid for it, all the others still consumed all that electricity and no good came out of it! The severity of this problem grows exponentially with the size of the network. 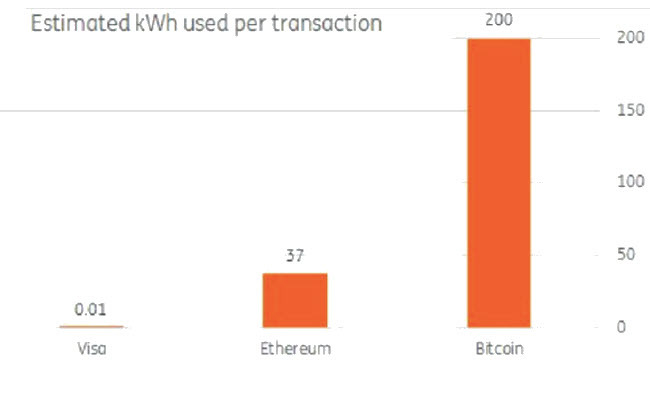 The global bitcoin network is already estimated to consume more electricity than some small nations. Let that sink in. More than entire nations. Ultimately, I believe that the best implementation of the DLP will be the one which is most efficient - evolution works along the same principle. Did the seminar cover this? My gut feeling (as I know virtually nothing about crypto currencies) is that it has to be backed by something physical. The best physical asset is energy production. Bitcoin is the exact opposite, backed by energy consumption. can imagine a crypto rouble for example backed by energy production in Russia traded between Nations that import energy from Russia. Likewise, locally renewable energy production could issue a crypto currency to trade energy generated in exchange for local products. Created when energy is produced and destroyed when the energy is used. Recall that the 1st computers were the size of most living rooms and consumed much power too. Progress was made so that today a hand held tablet has more computing power and consumes roughly the same amount of energy as a CF light bulb. If the truth matters to anyone, the modern ASIC Block Eruptors are very low power and run off of a very low power PI 3B computer which is about the size of a modern credit card. And heaven forbid we morph the discussion with the free energy from solar or wind or geothermal technologies. That would be so unfair. Hmmm , , , credit/debit cards seem to be a nice segue into digital currencies don't they? It seems prudent to mention the only big difference between credit/debit card digital currencies and Blockchain digital currencies . . . That bears repeating: the only big difference between credit/debit card digital currencies and Blockchain digital currencies . . . But 1st, consider M.A. Rothschild ; Quote: Give me control of a nation’s money supply, and I care not who makes its laws. Now, who has the ledger for keeping the credit/debit card digital currencies honest ??? Well, going there is very hard going for sure while throwing mindless trash at Digital Ledger Technologies that we know next to nothing about is so very easy as their much smaller and easier targets than the purveyors of today's horrifically dishonest digital currencies. It reminds me of the pattern of assault on the internet way back when Al Gore 1st invented it. It certainly doesn't look like the efforts to squash the internet held much sway at all. Can't dismiss the notion that today's trash against what appears to be an effort towards honest currency will have the same success that the internet trashing did. Moreover, our governments can nationalize the peoples' stuff at will. So while I think the scenario unlikely, I'll acknowledge that it's possible. Let me propose a green alternative to BC. It'll still be blockchain technology, and it'll still use proof of work. But all calculations have to be done in pencil, and the miner's name and sigature has to be at the top corner of the page, along with date and page number. When you said "proof of work", what did YOU mean by "work"? (Did you mean the kind of work I do? I thought not.) Kudos to climber99 for identifying the divergence. Yet the consumptive option is also the military option; and often the "take and consume" option when perfected can overrun the "produce" option when perfected. If that is so, we may be in for a very bad time. It's no coincidence that though there are mhny types of cultures, nowadays all nations are of the agrarian-warlike variety. Likely nailed it; well done! wow, thanks for taking the time to write and share this. you did a masterful job of tackling this complex issue. I believe you are write on many fronts. I do actually hope you are wrong on The Orwell. Humanity needs an honest, decentralized solution. Problem is, humanity doesn't always get what it needs. It often gets what it deserves. I have followed the investment space for years now. The level of ethical, good, moral behavior is appalling. We are not in short supply of great ideas. We are in short supply of ethical actors. So many ventures turn out to be run by immoral sociopaths that are running ponzi's, mis-representing statements, not using segregated allocations, etc. the challenge, it seems, is to figure out how to build a decentralized model that protects against the pool of humanity that wants to take advantage of others. this should be an interesting story to watch unfold. thanks again for the great write up. I just invented the RealNewsLedger and its associated coin called NoBullshit. Buy it up! That seems to be what PressCoin (https://ico.presscoin.com/) tries to be. There are dozens of more efforts if you want to use a search engine. ...oh what a difference a week makes! Of course I can't say I'm surprised...except that XRP (the Ripple coin) still has a market cap of $65 billion. It should be closer to $0. One key feature omitted in solarcoin and other crypos (to my knowledge) is the ability to shrink the money supply. The major advantage of a debt backed currency that we have now, otherwise known a fiat currency, is that money gets taken out of circulation when debts or interest get paid or debt gets written off. Hence fiat currencies are self limiting and can cope when we enter our Net energy descent at the end of our fossil fuel era. Interested in hearing the thoughts of the crypto community on this issue.